$6.49 & FREE Shipping on orders over $59. This black, beverage out quick disconnect comes with a barb for attaching to a gas line, and it's made by CM Becker so you know it is high quality. Note: Sometiems ball lock fittings can be difficult to get fully seated on a Cornelius keg. We recommend using a quick spray of sanitizer solution to act as a lubricant and giving it a few twists while applying the ball lock. Do I need 1/4" flare fitting and 1/4" swivel nut to attach this to a 5mm ID tubing? BEST ANSWER: Yes, you will need both the 1/4" swivel nut and the 1/4" barb fitting. You will probably have to warm up the end of tubing by dipping the last 3 cm into hot water (use a microwave to heat water in a cup) to be able to insert the barbed in easily. Otherwise it is a struggle to push the barb into room temperature tubing. Yes, a better way to go as compared to a connector with a hose barn end because you can detach to clean or to change to the pin lock style connector. The barb is 1/4" (6.35 mm) which is larger than 5 mm. Depending on your tubing, it might not fit on the barb. I have a set of 1/4" flare keg connectors. I need to connect these to 8 mm gas tubing and 6 mm beverage tubing. What size flare to barb connectors do I need? BEST ANSWER: 8mm would be closest to 5/16 barb. 6mm would be closest to 1/4” barb. Thank You! I think I have it figured out now. Just so I am clear before ordering....these come with the NFL flare? BEST ANSWER: Yes, the flare is inside the fitting. 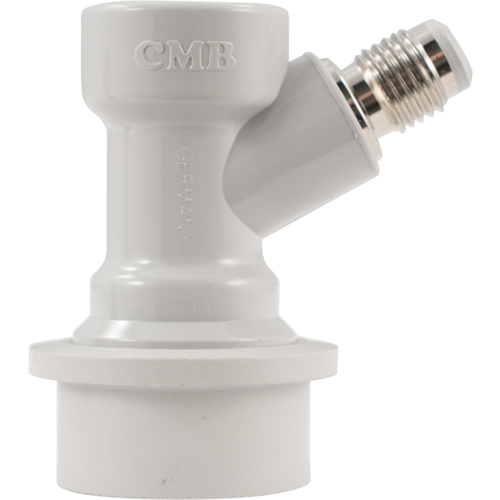 CMB ball lock connectors are the only ones I trust. They are the highest quality available. I have had no problems with this product. It works with no issues. I'm sold on these connectors with the flare fittings. No more cutting the tubing. I prefer these over the barbed version because its easier to remove the tubing come cleaning time. Recommend to have some keg lube handy to put a thin layer on the keg post before applying this...makes attach/detach much easier. These unscrew apart for easy internal cleaning. Easy to connect, disconnect. Mine have lasted forever. I feel like I only have to replace them when I lose them. Love these for the ease of use. Cant screw it up, it only goes on the gas side doesnt fit the liquid post. Order more than you need as you'll want some extras for various reasons. This is what you need if you own a ball lock corny keg! I own 6 of these and have not had any problems with them. Just like everything I order from more beer it's high-quality and worth the money. Makes solid connections, and the benefit of being able to disassemble for cleaning, makes it superior to the barb version. I've had this connector for 2 years and it's still as good as new. I love the ball-lock fittings in general, with the flare fitting they are versatile as can be. Tough and easy to clean, these are a great swiss-army-knife for gas transfer. These are a much easier to use option, compared to the barb version. There is some additional price, since you will need the barb & nut, but in my opinion it is worth it. I will trade a keg of my brew for a keg of a friends brew often, and sometimes they will have a pin-lock setup. Having one of each of the flare connectors makes the switch-out in my kegerator a snap. Been using these for 3 months now without any problems... Just don't put the gas line on the beer size and vice versa... Don't be an idiot like me. Much better than the barb versions since you can easily disassemble. Make sure you get proper gas version if using on IN end of keg. This makes kegging super easy. Fast and safe (for you and for your beer). Get it! Great product. Make sure to get the barb and you'll have no problems carbonating and/or pushing CO2. Snaps onto ball locks easily and quickly. Great Bang for you Buck! Oh Ball Lock Gas Line in, I put off buying these things because I did not budget these in my Keezer build but I mean you don't really have any options. MoreBeer still managing to be the cheapest with free shipping was once again my one stop shop for my keezer parts. I snatched 5 of these bad boys up and jammed them into my gas line tubing also bought from here. Warming up the end of the tubing while also warming up the metal end of this thing really helped get the tubing on easily. Its been several months and I've used and abused these things shoving them on the wrong posts and everything but luckily the flared fitting kept me from jamming my gas line into my liquid out and ruining my regulator. Very pleased with this product!